because it's being mediated by some chemical substance." Dieter Broers' film is all the suggestion we need to realize that we have come to the end of our infatuation with the straight line, and are awakening to a virgin appreciation of all it means to be human. I gladly recommend it. This is one of the most profound films I’ve ever watched in all my years with NEXUS! It is scientific and current, and has excellent visuals and graphics to help explain the concepts. A ‘must-watch’ film indeed! I saw 'Solar (R)evolution' just a few days ago, and it is awesome. It is helping set a whole new standard of quality, depth and tone in documentary film production. Congratulations on a spectacular creation. I thought Solar (R)evolution was beautifully produced, conceived and directed and the message (many messages) conveyed are so important for us to hear today. A great job. You should be proud of your accomplishment. 'Solar (R)evolution' is one of the high points in the emerging genre of consciousness / science based movies that has appeared in the mainstream culture over the past 15 years. The extreme relevance of this film is that it shows us the direct relationship between neurochemistry and cosmic wave activity; a correlation that graduates our collective human awareness to the realm of galactic citizenship. I cannot think of a worthier viewing experience than this. It gives voice to expanding reality and hope to a planet desperately in need of creating alternatives possibilities. For those who haven't seen this documentary, 'Solar (R)evolution' won the EBE Award for the best long film and is one of the best documentaries IN YEARS!! Earth shattering! My instincts have been confirmed! There is so much astounding information in this doco-movie that authenticates mind-heart-spirit connection....and how we are all connected. To hear detailed information from top scientists and other well respected experts that verify a connection between our thoughts, decisions and sensory perceptions that are indeed positively influenced by astrological forces is beyond incredible! This doco-movie is a must see for enlightened thinkers but more so for people who truly wish to believe in a bigger force that affects us all... and want to know more. Well here is the proof! 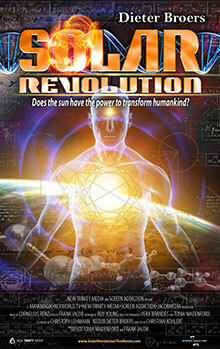 'Solar (R)evolution' provides you with not only accurate awe-inspiring information that will make your brain go into over-drive but it leaves you feeling mega motivated about our/your/the world's/ future!.. Congratulations! Wow! What a beautifully crafted, professional production! It appealed to me greatly, but what impressed me more than anything was the integrity of the film, and the fact that it's very open and non-judgemental, and holds appeal for both the spiritually and the scientifically-oriented. I personally have a strong preference for the spiritual, and was happy to see scientific validation for what I've always felt to be true. My husband, on the other hand, veers strongly in the direction of dogmatic science, and has always been quite derisive of my take on the upliftment of Consciousness. He sat through this film, however, in silence :) This, for him, was a first, and I believe it to be an obvious indication that he was now, even to the tiniest degree, widening his perception. Thanks so much for this great production. I'll be recommending it!! Something needs to change, and change it will. I have long felt that we are approaching a new era, and the wealth of scientific evidence presented by Dieter Broers and others in this film, affirms the hope I feel that we can establish harmony on this planet. A must see for all generations - this film needs to go viral!